What are the projects that I am prepared to imagine that will demand all my wisdom, experience, and skill? Where do I want to take my students? Are there new places I want them to go within the art of teaching? What is my unique contribution to the classroom, my discipline, and my institution? How can I chart my own vision of the teaching life in terms of pedagogy, scholarship, and institutional involvement? Do I have interest in a greater leadership role? The colloquy balances plenary sessions with small group discussions and workshop sessions, structured and unstructured social time, and time for relaxation, exercise, meditation, restoration, and lots of good food and drink. Front Row (left to right): Nancy Lynne Westfield (Drew Theological School), Paul Galbreath (Union Presbyterian Seminary), Chris Kiesling (Asbury Theological Seminary), *Lisa Hess (United Theological Seminary, Dayton), Miguel De La Torre (Iliff School of Theology). 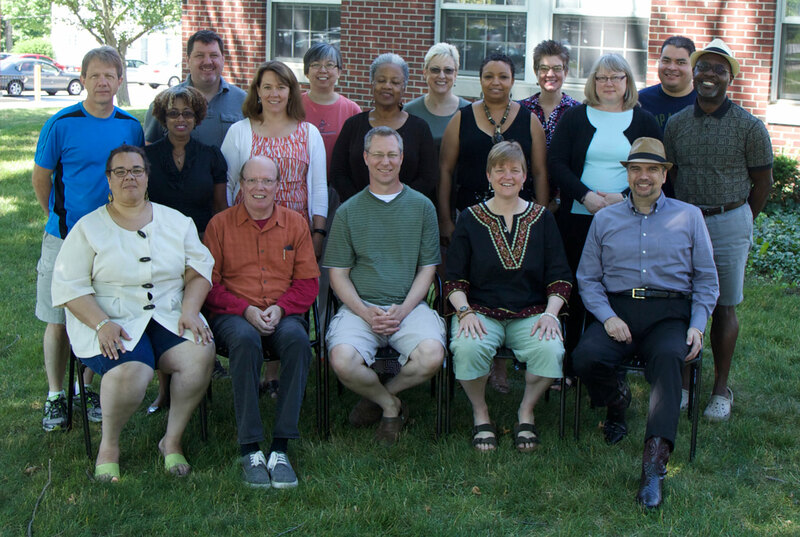 Second Row: *Paul Myhre (Wabash Center), Wilda Gafney (Brite Divinity School), Katherine Turpin (Iliff School of Theology), *Teresa Fry Brown (Candler School of Theology), Love Sechrest (Fuller Theological Seminary), Mary Hess (Luther Seminary), *Willie James Jennings (Duke Divinity School). Third Row: William Scott Haldeman (Chicago Theological Seminary), *Diane Grace Chen (Palmer Theological Seminary), Lisa Davison (Phillips Theological Seminary), Shannon Craigo-Snell (Louisville Presbyterian Theological Seminary), Leopoldo Sánchez (Concordia Seminary, MO).